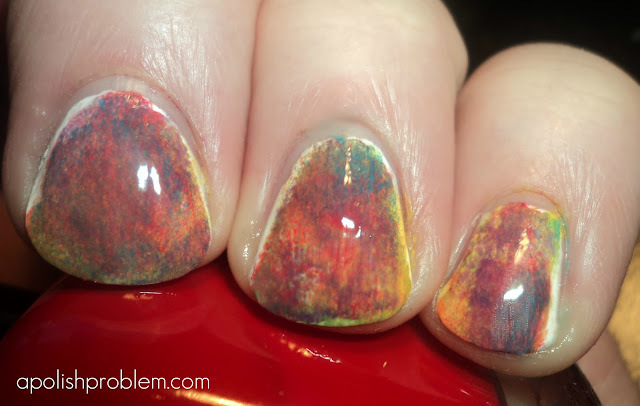 So, the concept of this manicure was to sponge rainbow colors on white nails using a makeup sponge. It was a cool idea in my head. Unfortunately, I didn't account for the colors becoming all muddled up. So, it does look more "tie-dyed" than anything. I used Zoya Sooki, OPI A Good Man-Darin is Hard to Find, ChG Happy Go Lucky, ChG Starboard, Zoya Robyn, and OPI Funky Dunkey over OPI Alpine Snow Matte. I then topped it with 2 coats of Nubar Diamont. I think was a fail, but it's oddly fascinating, no? I like it. It sorts looks like Monet art. Therefore, it's a classic! Wow those look so cool! !